Configuration of customer's authentication, password, ways of resetting password and languages in Customer Portal. Text for SMS message - here you can enter the text for SMS messages. Configuration of main modules to be displayed in Customer portal. You can choose from Statistics, Services, Finance, Messages, Tickets, Documents, Profile, About, News. Configuration of items to be shown on a Customer Dashboard. Here you can enable option Show Portal News and the last three portal news will be shown on a customer dashboard. You can select following items to be displayed on Customer Dashboard: Balance, New Tickets, New Messages, Unpaid Invoices, Unpaid Proforma Invoices. Below is an example of Customer account in portal with all items selected to be displayed in Side menu and Balance, New Messages, Unpaid Invoices selected to be displayed on a Dashboard. Configuration of customer profile which will give customer option to view his contact information or to edit it. To be able to edit and save changes customer can be asked for his current password. You should enable an option "Ask Password" for that. For each of these items you can choose an action customer can do with it: View or Edit. 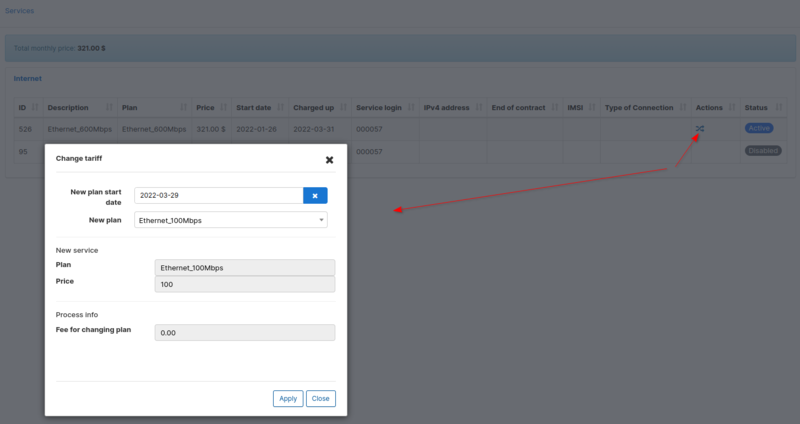 Items you've selected as just to be viewed in Customer Account will have dimmed fields and items which customer can change will be with white fields. Configuration of services and service fields to be displayed in Customer portal. Here you can also enable an option showing how many days left until the end of the service. Internet Service - Customer ID, Price, Login, Radius IPv6, Change plan, Description, Start date, IPv4, Type of Connection, Password changed, Plan, End date, Test, Stop/Active service, Status. Voice Service - Customer ID, Price, Phone, Status, Description, Start date, Stop/Active service, Plan, End date, Change plan. 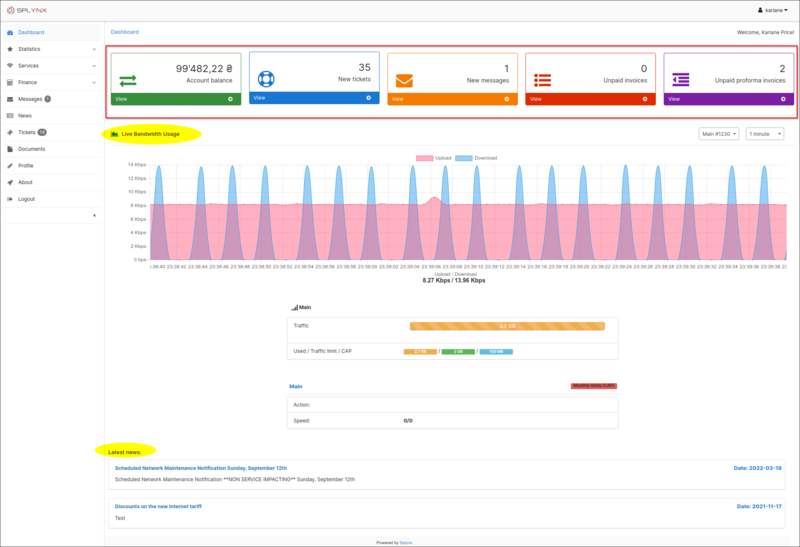 Custom Service - ID, Price, New, Stop/active service, Description, Start date, USD/year, Change plane, Plan, End date, TEST field, Status. Password changed - enabled option will let customer change password for his service. 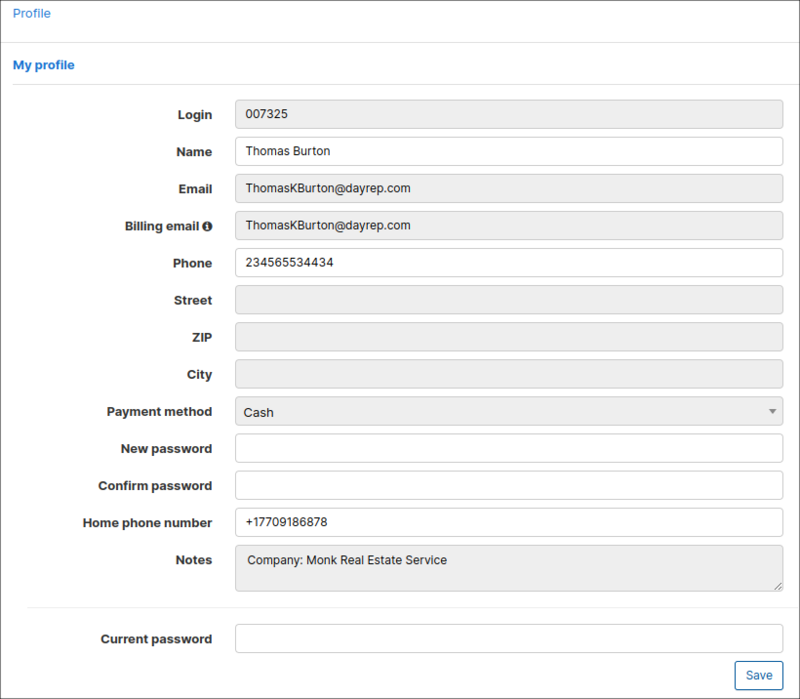 Customer will be able to change password by clicking on icon in Actions section of the table in Services. Change plan - enabled option will let customer to apply for a plan changing via Customer portal by sending a request to technical support. When option is enabled customer will see an icon in Actions in Services. By clicking on that icon a window "Change plan" will appear where customer will choose an option Manual change request. The window "Create ticket" will appear where customer will choose Priority of the ticket (Minor, Major, Critical) and write a short message. Customer can also upload a file by clicking on icon Upload below the text message. Configuration of financial items to be displayed in Customer portal such as: Invoices, Payments, Proforma Invoices and Transactions, and Payment methods available for Customer, for example, Refill cards. Configuration of additional attributes to be seen in Customer portal, for example, GPS, Contract ID, Bank Account etc. For each of these items you can choose an action customer can do with it: View or Edit. Items you've selected just to be viewed in Customer Account will have dimmed fields and items customer can change will be with white fields. For example, you'd like to add a Customer's bank account as additional attribute to the Customer portal and you'd also like to give customer the right to edit his account number. 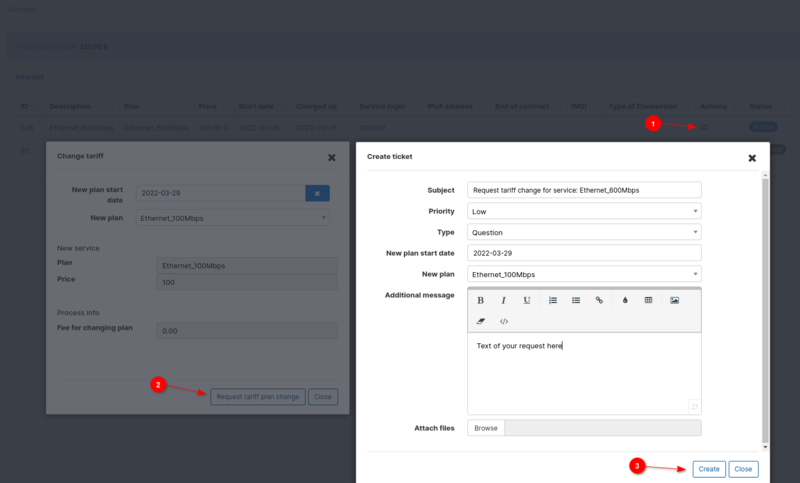 In that case, as soon as you will select options View and Edit in Bank account field in Configuration, customer will be able to see that attribute in his Profile in Customer portal and change it. Information about configuring Additional fields in Splynx can be found here - Additional fields.